2000 U.S. Women's Open pin flag autographed by 17 former winners of this major championship including many Hall of Famers: Amy Alcott, Betsy King, Laura Davies, Donna Caponi, Liselotte Neumann, JoAnne Carner, Sandra Palmer, Cristie Kerr, Juli Inkster, Hilary Lunke, Patty Sheehan, Karrie Webb, Birdie Kim, Pat Bradley, Meg Mallon, Annika Sorenstam (rare full name signature) and Se Ri Pak. ONLY ONE AVAILABLE FOR SALE. 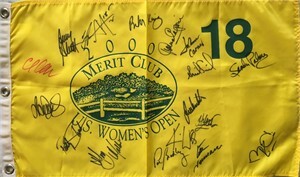 Obtained in person at the LPGA Kraft Nabisco Championship tournament. With certificate of authenticity from AutographsForSale.com.